With the number of employees on unpaid leave reaching a three-year high, Hon Hai Chairman Terry Gou recently criticized the government of avoiding their duties for the upcoming election. He called for the immediate signing of the cross-strait trade in goods agreement. Economic Minister John Deng denied negligence for the sake of the election, pledging to work hard until his final day in office. When asked to comment on unpaid leave, Hon Hai Chairman Terry Gou said the government has been too busy with elections to care about this subject. 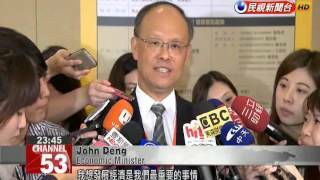 (Unpaid leave) will continue because Taiwanese (officials) are too busy with elections. Economic development is our top priority. We will work on this until the very last day of my term in office. We won’t divert our attention to elections. A leading domestic panel maker, Chunghwa Picture Tubes, has put 2,500 workers on unpaid leave. Guo believes that a cross-strait trade in goods agreement should be passed as soon as possible, allowing Taiwan-made panels to be sold to China at zero tariff. If the 5 percent (tariff) can’t be lifted then I think unpaid leave for Chunghwa Picture Tubes workers is just the beginning. Other panel makers such as Innolux, which has more than 60,000 employees and AUO, that also has a lot of staff, will be affected. Let alone the upstream and downstream supply chain including material suppliers. The original timeframe for major advancements in the cross-strait trade in goods negotiations was set for the end of the year. However, Economic Minister Deng says many issues remain, making it hard to achieve consensus with Chinese officials. So it’s unlikely to meet the original timeframe.